South Korean Jang Ha-na earned her third LPGA victory of the season in Taiwan on Sunday, holding off a charging rival from China in the rainy final round. 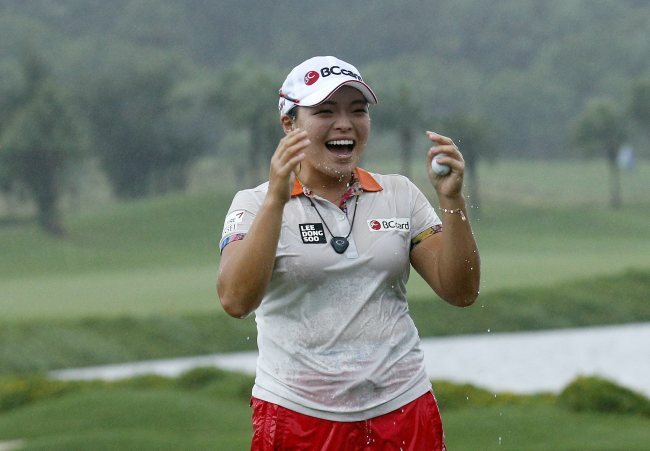 Jang captured the Fubon LPGA Taiwan Championship at 17-under 271 to beat Feng Shanshan of China by one stroke. Jang shot a final round of 71 at par-72 Miramar Golf Country Club in Taipei with three birdies and two bogeys. She takes home $300,000 in the first-place check. She is the first South Korean to win three times in 2016. Five others from the country have won on the tour this year. Jang is also the third straight South Korean winner on the LPGA Tour. Kim In-kyung won the Reignwood LPGA Classic in China last week, and Chun In-gee won the Evian Championship on Sept. 18. The tour will make its South Korean stop Thursday at LPGA KEB Hana Bank Championship at Sky 72 Golf & Resort's Ocean Course, just next to Incheon International Airport. Jang started the final round with a comfortable six-stroke lead over Feng at 16-under. Jang had her first birdie at the second and added two more at the fifth and sixth holes to reach 19-under. Just when she looked to be in cruise control, Jang bogeyed two of her next three holes to fall to 17-under. Feng traded in three birdies with a bogey on the front nine to make the turn at 12-under, and two straight birdies to open the back nine got her to 14-under, just three behind Jang with seven holes to play. Feng chipped in for a birdie at the 15th to reach 15-under, two behind the South Korean, and nearly holed out for an eagle from a greenside bunker at the par-5 18th. Jang parred every hole on the back nine to hang on for the narrow win. 69 on Sunday. Park Hee-young shot an even 72 in the final round to end at nine-under for the tournament, good for a three-way tie for fifth. This has been an up-and-down season for Jang, who had a fast start to the season and then found herself in the center of a bizarre controversy that eventually led to a two-month layoff. Jang won her second start of the season in February, and added another win three events later at HSBC Women's Champions in Singapore in early March. But before that tournament in Singapore, a bag belonging to Jang's father tumbled down an escalator at Changi Airport and hit fellow Korean player Chun In-gee in the lower back. Chun was forced to miss a month of action with back problems, while Jang was heavily criticized by Chun's fans for her exuberant celebration of the victory in Singapore. Another bit of controversy brewed over the apparent lack of a proper apology from Jang's camp. Dealing with stress, Jang withdrew from a tournament in late April and didn't play again until the second week of June. Her agency said at the time Jang had been suffering from blurred vision, dizziness and vomiting, and had also experienced trouble sleeping since mid-March. The saga may just have a happy ending. Chun won the Evian Championship, the fifth major on the LPGA calendar, last month in a record-breaking fashion, and is now the highest-ranked Korean player at No. 3 in the world.